As you might be aware, Simple:Press is in the midst of a transition to new owners. The transition is being conducted in slow, measured steps so that users are relatively unaffected by changes. Visitors to www.simple-press.com will be greeted with a completely revamped website. New colors, a simplified product offering and a whole new design are just some of the changes that will be evident. While the changes are not 100% complete at this time, most of the big ones have been made. All that’s left are the “nip-and-tuck” items – basically cleaning up stragglers such as incorrect hyper-links, mis-matched colors, terminology, spelling mistakes, getting final graphics in place etc. As part of the website revamp, significant changes were made to the store. The biggest one is that Product purchases are no longer separated from support. And, in fact, all users will be eligible to participate in a basic level of support known as “community support”. We will explain “community support” later below. The concept of “memberships” have been removed since all product purchases now includes at least a basic level of support. When you visit the revamped site you will see a new menu option for PRICING that will show the three new primary pricing levels. All new levels include all plugins, themes and templates. However, they do not include any graphic packs (such as premium avatars and icons). Additionally, you will see a new menu option for add-ons (aka plugins and themes) – this is where you can purchase individual components if you do not want one of the three core bundles. The new store also now offer you the option to checkout with either Paypal or a credit-card (powered by Stripe). We have updated pricing for NEW users. Pricing is now based on the number of sites that add-ons (plugins and themes) are being used on. And licenses are now limited to 1 year. After the year is over, plugins and themes cannot be updated until a license is renewed. However, all purchases will continue to work after a license expiration – until such time that a core Simple:Press change, WordPress update, PHP update or other software or environment update might prevent the plugin/theme/templates from working. At that time, if you’re not on a current plan you will need to subscribe to a new plan to obtain security and compatibility updates. All new purchases are set up on an automatic renewal plan – with multiple notifications sent out ahead of time before an automatic renewal is processed. You can cancel subscriptions at any time. Additionally, we have created three primary bundles with names that are siblings of our old membership plans. These bundles effectively replaces those plans. All three of these new bundles include all plugins, themes and templates. The only difference between them is going to be the level of support offered. The ability to purchase a single plugin or theme will still be available. However, pricing for each item has been increased and individual purchases only include basic / community support. In the past, we have separated support from product purchases. Thus, we had memberships – which is how you obtained support – and we had product purchases as a separate option. You could purchase one without the other. This separation has been removed. Whereas in the past, a user could not get any kind of support without purchasing a membership, now, all products now come with the ability to get some level of support. Support is provided either directly from us or from a community of fellow users. You can find out more about what each of these levels mean on our Support FAQ page. The Gold and Platinum bundles include support directly from our technicians. All other purchases, including the silver plan and individual plugin or theme purchases include basic/community support. Finally, as you might expect, there is no free support for custom code in any of our support plans. We are now issuing licenses for every product purchase. Right now, licenses are only being stored in your account and are not being validated. But at some point in the future we will start to validate them before allowing upgrades to proceed. We will send out a separate notice when that starts to happen. Existing users will see their licenses in their ACCOUNT screen – those licenses have been set to lifetime status. Existing Users: What do all these changes mean for you? We have two classes of legacy users. Those who made purchase from our Easy Digital Downloads Store (starting in July 2015) and those who purchased before that. Most existing users with existing plugins will not see any changes other than the cosmetic changes on the site. Existing users with existing plugins will see no changes. The plugins you own you will continue to own and continue to get updates. Existing users with existing subscriptions will see new prices on add-ons and themes. New users will see new prices. Users with an existing PLATINUM membership should contact us for a personal discount code when ready to purchase additional add-ons. This code will allow you to obtain plugins at zero cost for the duration of your membership. Unfortunately we do not have any way of verifying your individual plugin and theme purchases. Therefore, while you might be able to continue to update for a while, you will slowly lose access to those updates as we transition our updates to validate licenses via the EDD store software licensing module. I have a current Silver or Gold Subscription – what does that mean for me? Your existing plugins that you have purchased have a lifetime license attached to them. By now though, your right to purchase plugins or themes at a hefty discount has expired. If you need additional plugins you will need to purchase these at the new store prices or purchase a new bundle subscription. I have a current Platinum Subscription – what does that mean for me? Your existing plugins have a lifetime license attached to them. New plugins you purchase will have 1 year license – though those licenses will be for zero cost. To get new plugins at zero cost please contact us for your personalized discount code that will be valid through the period of membership. I do not have a current subscription – what happens to the plugins I have already purchased? For users who purchase in or after July 2015, any plugins or themes that you have already purchased will continue to receive lifetime updates. New plugins or themes that you purchase will be licensed for 1 year only. For users who purchased before July 2015, you will will eventually lose access to updates since we have no way of validating the individual plugins and themes you downloaded. I have purchased plugins and themes in the past – how do I get support now? You can purchase a new bundle from our new pricing page. Each bundle has a different level of support so you can purchase the one that will give you the level of support that you require. Learn about the different levels of support on our Support FAQ Page. Are there discounts for renewing a subscription plan? No – we have priced things low enough that we do not feel discounts are necessary. Even with our most expensive platinum bundle, the cost per plugin/theme is less than $2.50 each! There are some cities where you’d be hard-pressed to buy a decent cup of coffee for that price! 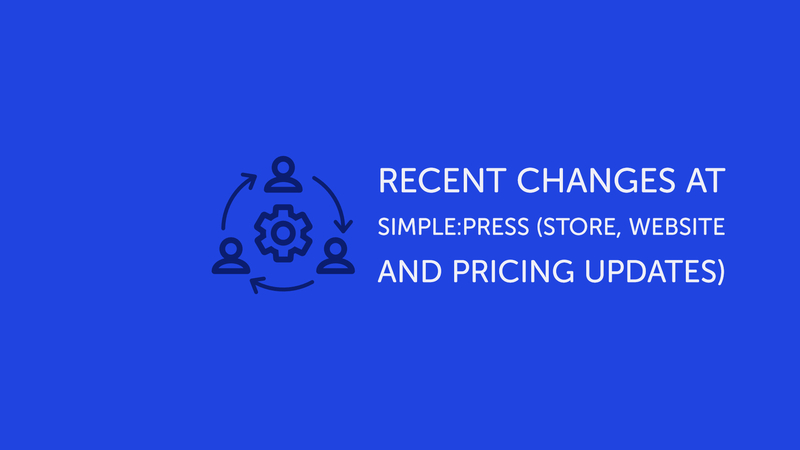 The next phase in our transition will be the release of version 6.0 of Simple:Press. The new release includes an all new internal architecture and will be the basis of all future development. A separate announcement will be made about this – most likely before the end of 2018. Did you find this article useful? Or do you use Simple:Press today? If so, please support Simple:Press with a review on WordPress.org. Every review goes a long way towards bringing other users on board! Simple:Press 6.1 was released to the wordpress.org repository earlier today. Included are a few bug fixes and some minor new features along with the first pass of our new licensing infrastructure. 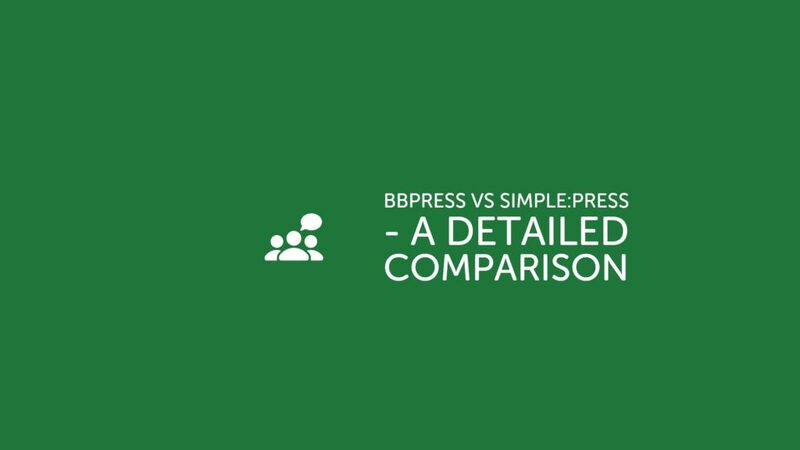 In this artile we’re going to go in-depth and hands-on to compare two of the most established WordPress forum plugins – Simple:Press and bbPress. Get The Simple:Press Platinum Bundle For one low discounted price. Includes all 70+ plugins and themes. Save up to 90% with a bundle instead of purchasing plugins and themes a'la carte!